When it was opened, the market was considered to be "the most beautiful in the world" (qtd. in "History of the Grainger Market"), and it is still one of the largest market halls in England. 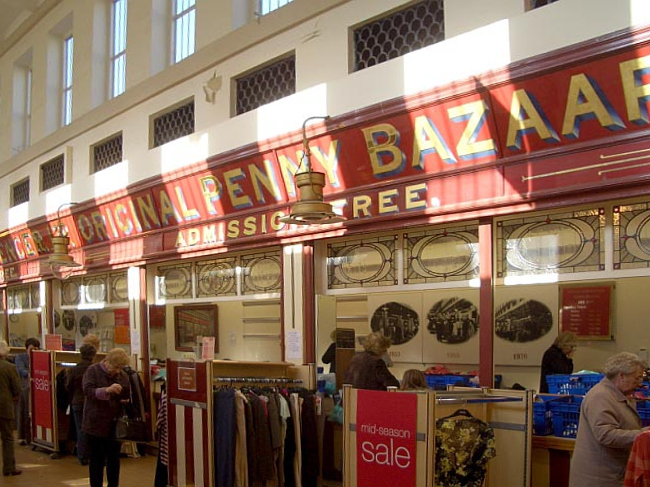 On the other hand, it contains the world's smallest Marks and Spencer's store, opened in 1895, "the last surviving example of the [Penny Bazaar] shops that gave birth to a legend in retailing" ("Visit Newcastle: Markets"). The Weigh House is the original facility used by retailers and customers to check the weight of their goods, but it now seems to be used mainly for checking body weight! The notice above the 10p. charge sign says, "Please do not bring food or drink into the Weigh House." "History of the Grainger Market." Grundy et al., eds. The Buildings of England: Northumberland. Harmondsworth: Penguin, 1992, p. 455.